Book suggested for rating by Nathaniel Hale 1775. I bought this book some time ago but didn't look at it until now. From what I have read so far Fowler had a deep understanding of the English language and had that rare capacity of making an otherwise dull subject interesting and even occasionally funny. Certainly something worth perusing if one has the time and inclination. It is my hope that this year concrete and positive steps will be taken to achieve progress towards the union of Africa... He saved himself the trouble of thinking of a suitable adjective by putting in a couple of cliches. One may perhaps walk up concrete steps but one cannot `take' them, and any steps must be positive unless indeed it is a step backwards; the speaker cannot have thought it necessary to warn his hearers against thinking that that was what he meant. Persons and what they do, things and what is done to them, are put in the background, and we can only peer at them through a glass darkly. It may no doubt be said that in these examples the meaning is clear enough; but the danger is that, once the disease gets a hold, it sets up a chain reaction. A writer uses abstract words because his thoughts are cloudy; the habit of using them clouds his thoughts still further; he may end by concealing his meaning not only from his readers but also from himself, and writing such sentences as The actualization of the motivation of the forces must to a great extent be a matter of personal angularity. I half expected this book to date from 1800s (with its precision and confidence), and so am glad to find it is from our period. I'll be looking into it. I have the second edition, which was updated by Sir Ernest Gowers around 1965. And all is well in hand. Look out across the land! This is a useful book; I've learned quite a few things from it. I also like the author's frequent use of humor in showing examples of confusing writing. I have a well-worn first edition. Copies can be frequently found at library book sales for less than a dollar. This book has also been discussed a little in the "Grammar School" forum: see the "Welcome" topic there. 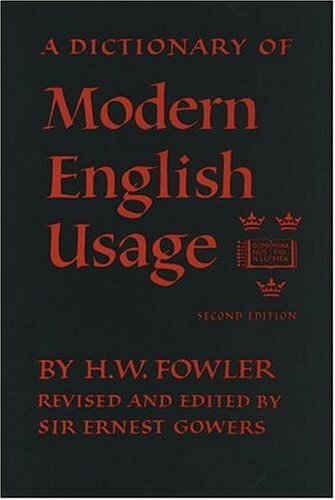 Another book on English usage that I like is A Dictionary of Contemporary American Usage by Evans and Evans, 1957. I have this teacher, a grad student, who suffers from abstractitis. Nothing she says refers to people or things, that is to say she is incapable of bringing any of her ideas down to the concrete level (i.e. to reality). They are rationalizations layered upon rationalizations. People are, for some reason or another, dazzled by the fact that she reads eight books a week and can quote Freud, Rousseau, Hegel, and Marx. So, of course, the class is only concerned with how these theories conform to each other, not how they conform to reality.